Today concludes the Octave of Easter. Thank goodness, because I think I went a little overboard with the feasting part. I took the whole “celebrate Easter for eight days” thing a little too seriously. 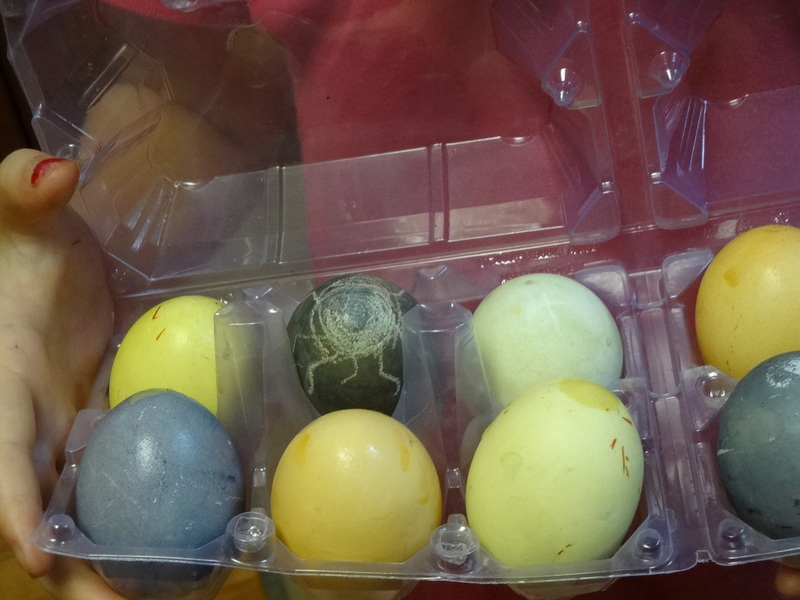 Easter Sunday started with hot cross buns and hard-boiled eggs that we had dyed on Saturday. 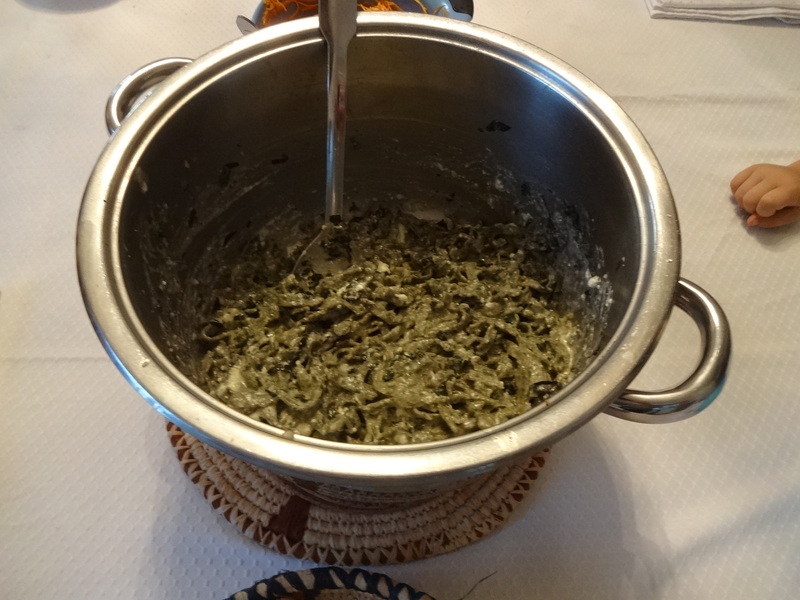 The yellows are from saffron, the very pale green is from spinach juice (left from the spinach I thawed to make pasta for Easter dinner) and the blue is hibiscus tea. I love that the red tea makes for a denim-blue egg. We scooted off to mass at the Vatican embassy, having made Easter vigil at our usual church the night before. Lunch was our usual grilled cheese, with some left over buns. 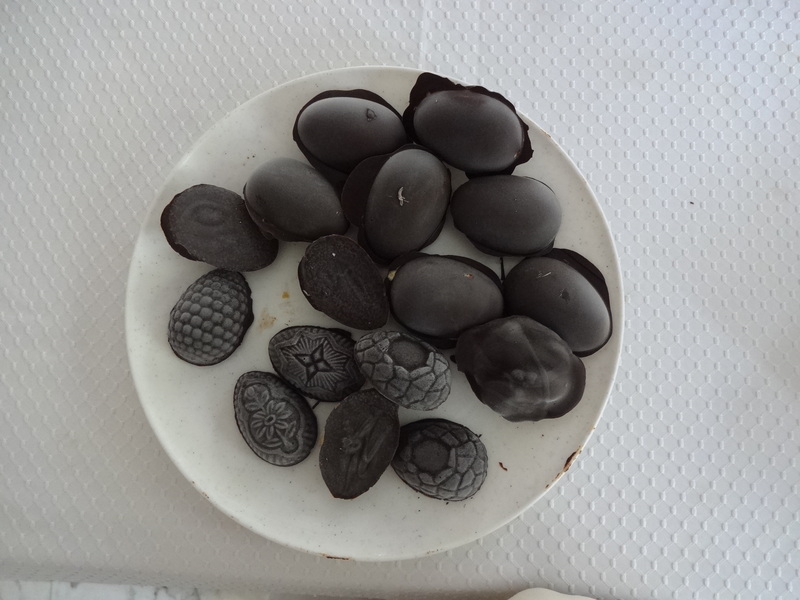 I also made filled chocolate eggs. The temper was off, so we kept them in the freezer, that’s why they’re frosted in the picture. The little ones with the pattern are filled with peanut butter, while the larger ones are filled with chickpea marshmallow fluff. I’m still playing with how to get it fully stable, but in terms of tempering the sugar with the chickpea cooking water, it’s a great trick. During the week I made various attempts at meringues and macaroons using the chickpea water. All were tasty, none were completely successful. Dinner was the homemade spinach pasta in a lemon/ricotta sauce. 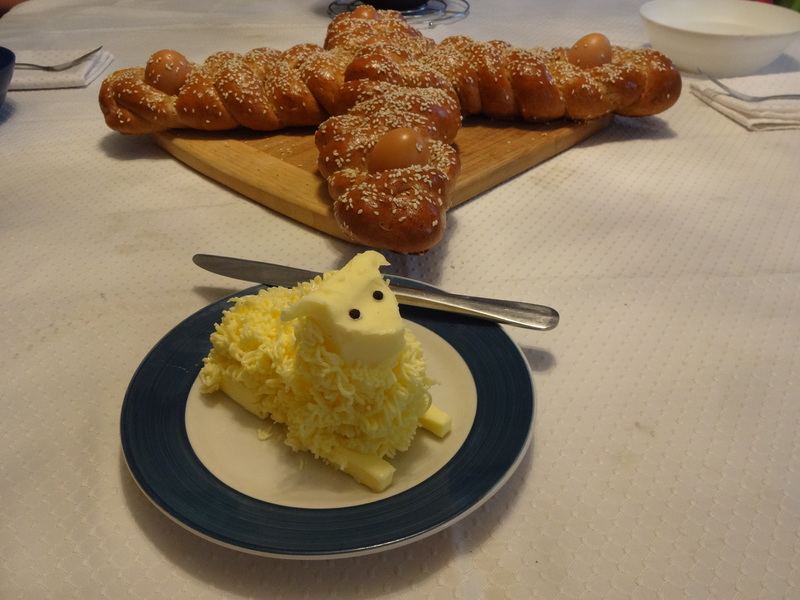 I also made bread (braided into the shape of a cross with five eggs baked in) and a butter lamb. Surprisingly, the kids were too full to have the angel food cake and mango curd I had made for dessert. Oh well, Easter gets celebrated for eight days, so we had that on Monday (and Tuesday, I think). I also made various cookies during the week, to include the meringues mentioned above. Much snacking (and much sugar) took place. 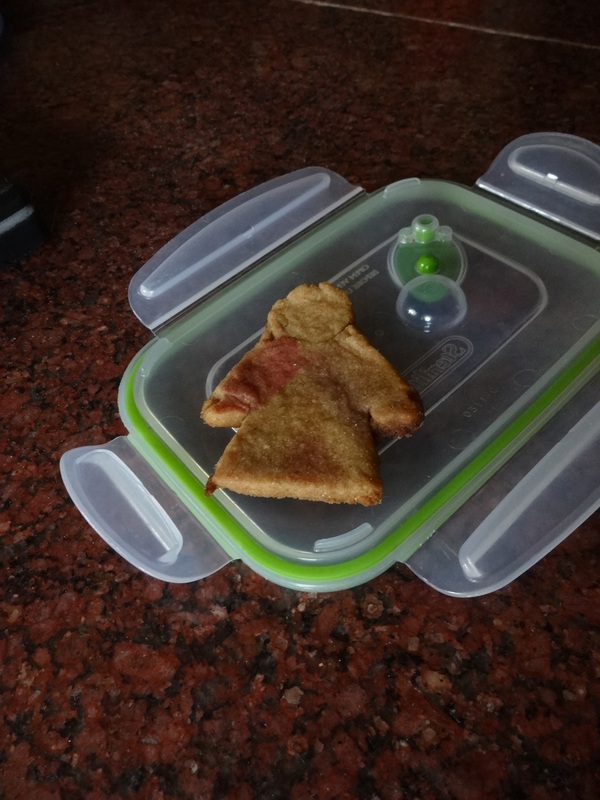 Today, for Divine Mercy Sunday, I tried to make divine mercy cookies. Not terribly successful, but not bad for modifying cookies made with a Christmas angel cutter. We took a short trip to our parish in the afternoon for their festival. Since St. Joseph’s feast falls during Lent, they decide to move the parish celebration to outside of Lent. Last year it was in June, tied to Fathers’ day. This year, they moved it to the first Sunday after Easter. I suspect the decision was made by the parish council without reference to the calendar. I’m not entirely certain you can supplant Divine Mercy Sunday with a parish feast, especially since the actual feast day wasn’t moved (it fell just outside of Holy Week). In any case, we went back to the Vatican embassy for morning mass rather than the two-plus hour spectacle that I assume took place at St. Joseph’s parish. Still, we decided to swing by the parish in the afternoon to say the Divine Mercy chaplet and to see if anything was still going on. There was a good sized crowd there still, and the kids had a good time running around, climbing on rocks with other kids, and playing with a beach ball and parachute. 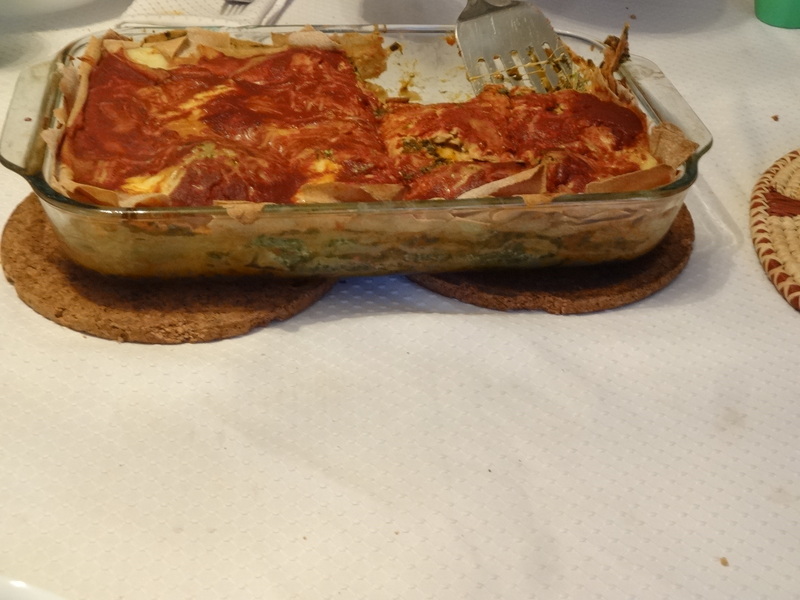 After we got home, I decided to make lasagna. From scratch. I still had homemade ricotta from last week, but needed to make the noodles and sauce. I also decided to see if I could roll out the noodles on the thinnest setting, so as to get lots of layers. Also, the thinner you roll, the more time it takes, not just because you’re making more passes, but also because you have to be more and more careful as the pasta gets thinner and thinner to avoid tearing and sticking (and cats, in my case). It turned out to be quite a success, and only took two hours from when I started the pasta dough to get dinner on the table. Beyond the festival foods, I was struck how the kids looked forward to some of our routine (non-Lenten) meals. On Friday, they asked if I was going to make pancakes (like usual) for Saturday breakfast, then during the day on Saturday, they asked if it would be a pizza night (as Saturdays usually are). I guess they did pick up on the culinary clues that Lent is a special time. While the focus is on repenting and reforming our ways, the physical, tangible changes in what we do and what we eat can help focus us on the spiritual reflection and work we need to do to draw closer to God and share eternal joy with Him; a joy that we get just a little taste of in the Easter octave.